Army team MEG and Bangalore Independents lifted BDFA League 2016-17 edition Super Division and A Division respectively. After a great start, Students Union could not hold on to the top position, and have to content with runners-up in Super Division. Jawahar Union makes a comeback to Super Division next season by coming second in A division. 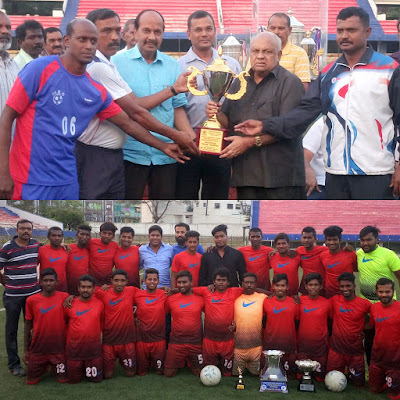 They will join the Vivek Nagar-based club Bangalore Independents, who topped the league in a convincing fashion. DYES and AGORC will be relegated from Super to A Division and Sri Gajanana and Postal will be relegated from A to B Division by finishing at the bottom of points table. There was an exhibition match played between the top two teams of both Divisions this evening. In A Division, Bangalore Independents lost to Jawahar Union 0-1 from a 14th minute goal from Jonathan. MEG defeated Student Union 2-0 in Super Division, Faizal and captain Ramu were the scorers. Several individual awards were given to the players.